The oldest Moving Company voted the "Best of Birmingham" by Birmingham Mag. We provide local and long distance moving, packing and organizational services for both residential and commercial customers with one-click moving quotes. Our boutique moving services are second to none in the south. We pride ourselves on exceeding customers expectations, creating raving fans, and ultimately building customers for life. That’s been our secret for the last 40+ years. Headquartered in Birmingham, Alabama since 1978, we are one of the South's premier full service moving and storage companies with our residential division specializing in home, high value antique and piano moves as well as our full service commercial division focused on large commercial, office and retail store moves. We have locations in Birmingham, Huntsville, & Mobile, AL as well as emergency first response teams dispatched in Panama City, FL and Wilmington, NC from last year’s hurricanes (Florence and Michael). Additionally we are helping those impacted by the recent tornadoes in Lee County, AL. Consistently voted The Best Skilled Labor Workforce in Alabama, our unique process revolves around you. We learn what you want, then tailor our services to meet your needs. Let us take the stress out of your upcoming move by requesting a free moving quote today! We encourage you to "Ask Around" before making a moving decision. Once you begin asking the right questions, then you will quickly see how we quietly became one of the Oldest and Most Respected Moving Teams in Birmingham, Mobile, Huntsville and the entire southeast by winning over one family at a time. We have over 200,000 satisfied residential customers; and a who’s who’s list of commercial clients ranging from Walmart, Amazon and Verizon. Every move is a story and our job is to hear yours and then put together the best logistical solution for you and your family. The more information you provide us prior to moving day than the more accurate your quote will end up being. You won't find any surprises on your final bill which sadly has become a standard within our industry. We believe in doing the right thing and simply telling you what you are going to end up paying for your move without having to pull the bait and switch on moving day. This means if our team believes you will need a 5 man crew with 2 trucks, then that is what we are going to recommend. Other reputable companies have made it a practice to quote a low 1-truck rate with 2-crew members, then when they arrive to your home they will have to dispatch a 2nd truck and crew effectively doubling your hourly rate. THIS IS NOT TRANSPARENT in our minds and will never be our practice. We are proud to say that last year more than 94% of our customers paid the exact amount between their quoted range price which we provide every single customer. NEED MORE ASSURANCES ABOUT THE COST OF YOUR MOVE? We offer free in home estimates upon request. We will walk every square inch of your home, estimate packing services and packing materials, and give you a binding or guaranteed quote for your move. This is also the case when you might have multiple destination points or require storage of your items. As a best practice, any home over 5000 square feet or with a $1M selling price automatically receives an in home estimate, because the scope of these jobs is simply too great to detail with a phone call. We disassemble and reassembled all furniture, beds and cribs on the day of your move. All mirrors, marble tops and glass shelves are removed and carefully wrapped by our team. All appliances are disconnected and reconnected with a simply release of liability and without the need for a third party service provider. We even deliver boxes for free prior to moving day! Starting in 2018, immediately after booking your move one of our concierge team partners will contact you to handle turning off all your utilities at your old home and establishing service at your new home. This is a free service for you and exclusive to Road Runner Moving customers. Let’s face it, who wants to have a half dozen calls with the power company, cable company, and other utilities making sure the power is turned off at your old home and on at your new residence. We do this all for free, and you will have one point of contact handling the entire process. We have over 30,000 square feet of long and short term storage and warehouse space plus a proprietary MOVR™ Truck System developed exclusively by our company. For our customers that do not have back to back closings or are maybe remodeling their new home, we can hold, vault, and store your household goods until you are ready for delivery. We utilize a comprehensive moving software system which nails every single moving quote factoring in 1000's of variables such as the square footage of your home, walking distance to our trucks, the number of floors, which items are coming from what floors, empty or partial rooms, packing & unpacking services and over-sized items like safes, pianos and pool tables. ALL LOCAL MOVES are billed actual time and rounded to the nearest 15-minutes. Driving time is calculated prior to moving day and is usually capped at 1-hour which enables our crews 30 minutes to arrive to your home and 30 minutes back to our location (this is a standard practice for all moving companies). Additionally our rates are the same every single day of the week with our peak rates being in the spring and summer months. Like all interstate moving companies operating under an authority, we provide an price based on the estimated weight of your home's furniture and distance traveled from your old house to your new house (origin to destination). Your quote is calculated using our tariff rate on file with the Department of Transportation (Our DOT# is 291712). For interstate moves, your furniture will be inventoried by our crew leader and you will be provided a copy after loading and to compare at the unload. However, we do not commingle multiple customers furniture and possessions on local or interstate moves. 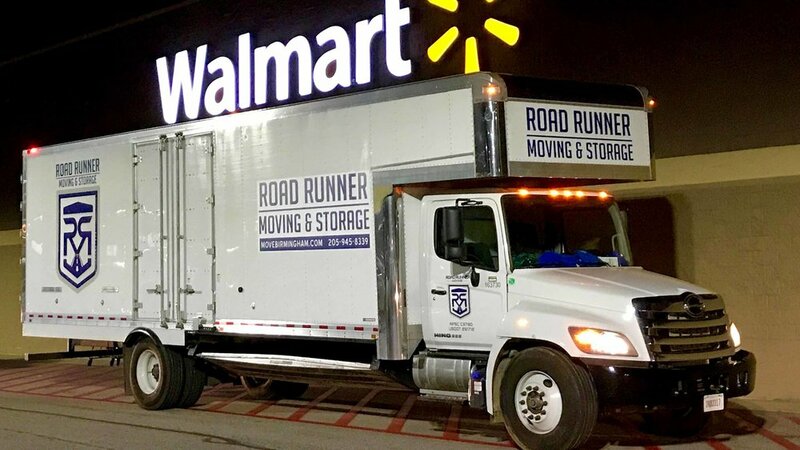 Also remember, the same Road Runner Captain and Helper that load your furniture will travel with you to the unload, and you will be in constant communication with your team leader. Unlike the major van lines, our crews will only load one customer's contents on a truck at a time, called exclusive use. We will pack and load your furniture with care and drive directly to your new home without commingling your furniture with other peoples items. This enables us to give you an exact arrival date and time. Most van lines will give you a 7-10 day window of when your furniture will arrive which most of the time is less than ideal. Road Runner employees are highly trained and experienced movers, drivers, and logistics professionals. Our men and women are actual “employees” and are covered by our Workman’s Comp Insurance through the Alabama Trucking Association. The safety of our employee partners is our #1 concern, and we have written safety policies and procedures in place to not only protect our team but also ensure your items arrive safely. SAFETY is one of the pillars of our corporate culture and has become one of our most important competitive advantages. In fact, Ellis Piano in Hoover, AL has been recommending our services since 1983 when we saved the day on a 4th floor and highly complex grand piano delivery. Our team trained directly with Steinway & Sons and we are the only recommended piano mover by their organization in North & Central Alabama. UAB, Samford and Birmingham Southern all utilize us when needing a piano moved. Simply click the free estimate button below or give one of our locations a call. We are available 24 hours a day, 7 days a week, 365 days per year. We proudly service the following corporate clients.